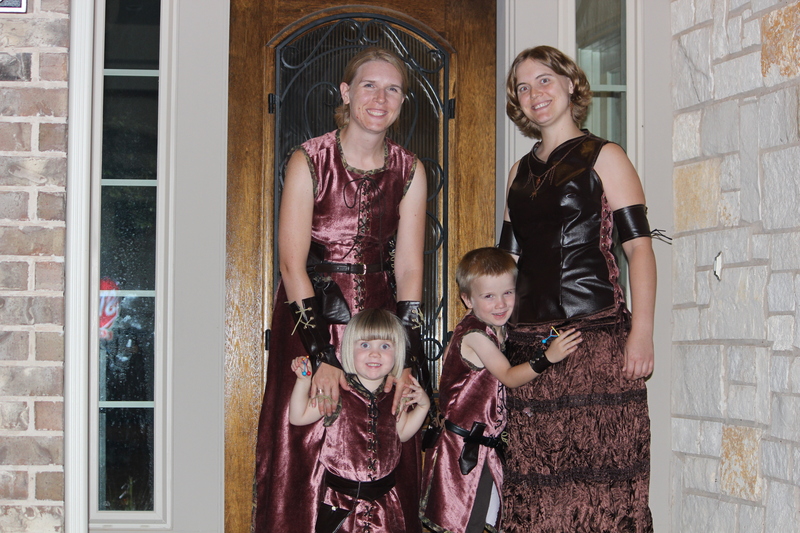 This picture was taken at home before we left for the Ren Fest, so we aren’t wearing our full array of accessories. 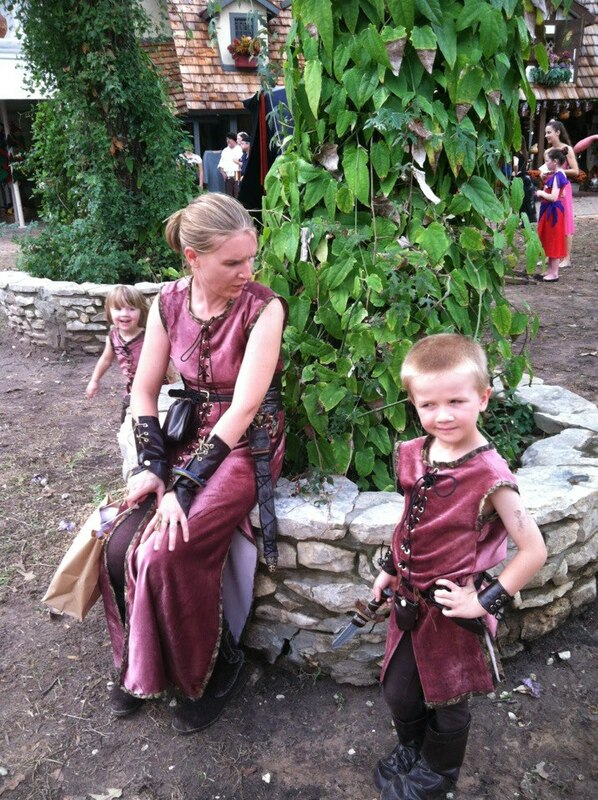 I like this picture because you can get a good idea of the shape of the lace-up tunics I made for the “Fantasy Ranger” line of costumes. Please note that I made the boot-caps and shoe covers for my niece and nephew completely from scratch and from my own pattern. My “Fantasy Bard” costume in this picture is pretty much complete as I wore it. Note the sleeves are functional as “Water Sleeves” which I learned how to manipulate when I was studying Beijing Opera, and they are held in place by lace-up arm cuffs. You can’t see them, but I have boot-sheath daggers and jingle-bell ribbons tied to my boots! Finally, I would like to proudly note that the only things in this picture that are made of fabric that I did not design and construct myself are the tights worn with the three ranger costumes. Tada! 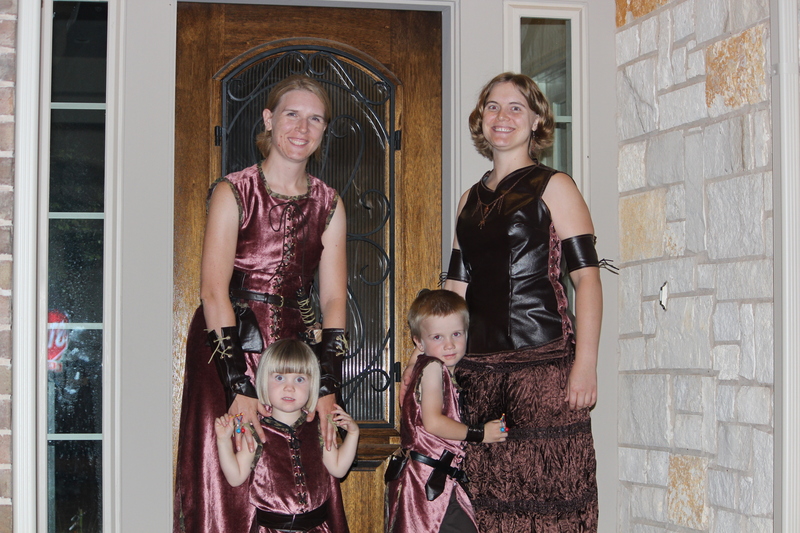 Accessories have been added, and on the far right is my friend Sarah, for whom I designed and constructed the bodice piece/sword belt and sheath. I hand-embellished the hilts and pommels of all the weapons, too. My sister is wearing her archer gloves backward at this point, though we turned them around and fixed it as soon as we got out of the parking lot. 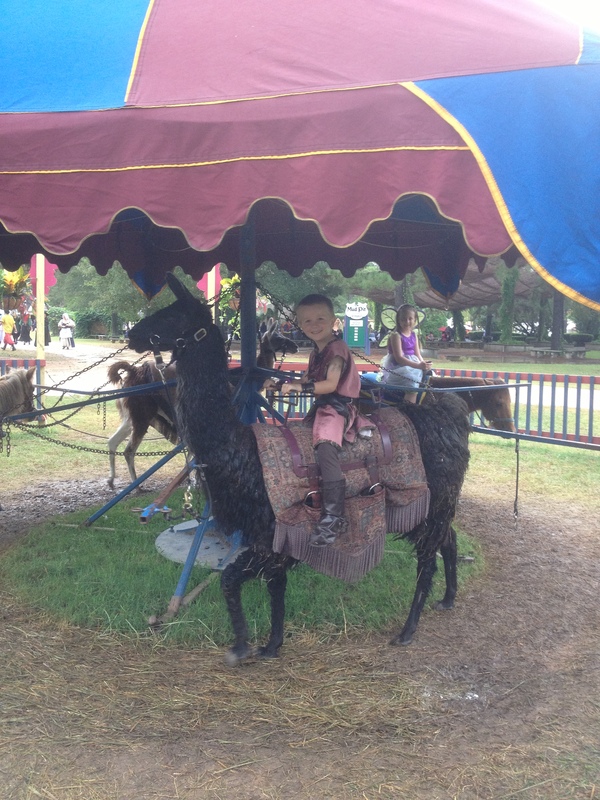 Aaaaaaaaaaaand here are my niece and nephew riding the “carousel” at the Ren Fest. How cute is that! And here we are on Halloween, yesterday. As you can see, I made myself a new costume so that I could match the other three! My bodice laces down both sides and I used chain and gilded-leaf embellishments that I made myself using a Gerber multi-tool. 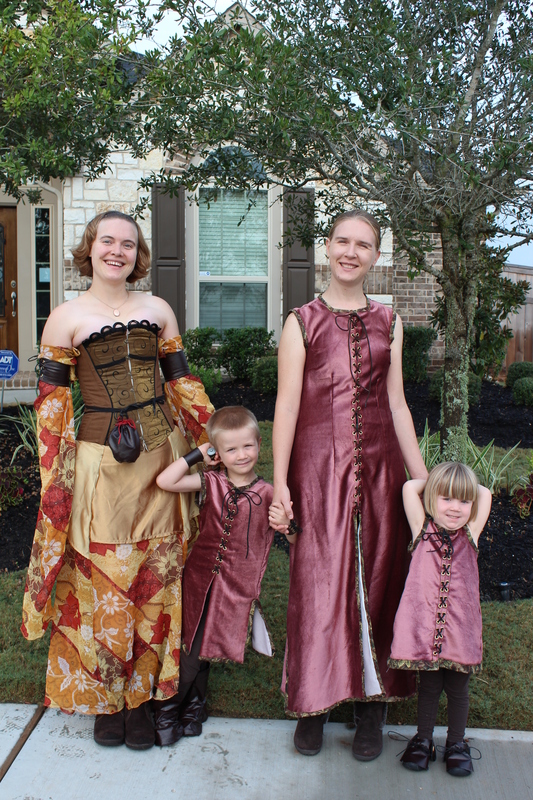 I had to get really creative to make the bodice, because I used the tail-end scraps leftover from the other five costumes (well, perhaps it’s four and a half, since my mom actually made that dress Sarah’s wearing for my Halloween costume in 1998, when I was in high school), and there were barely even tiny scraps of that pleather left once I was finished! I got exceptionally creative with pattern placement in order to get that kind of mileage out of a yard and a half of fabric (seriously! For two bodice pieces, boot caps, shoe caps, belts, bags, pockets, accessories, arm cuffs, archer gloves… you’d be hard-pressed to beat me in a battle of fabric economy. 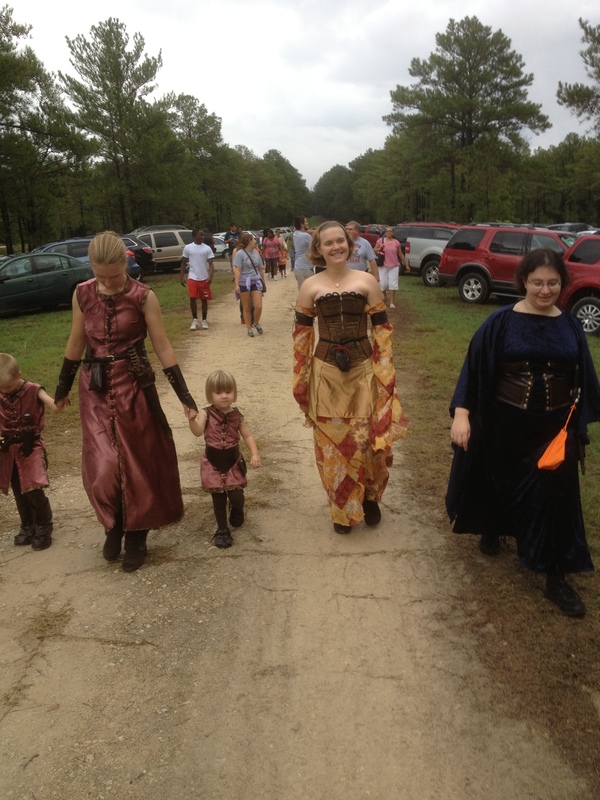 Incidentally, I just realized that in all these pictures, you can’t tell that except for the buckle area, my sister’s belt is underbust-bodice width with utility pockets and the like worked in. Clearly, I need to get some pictures of that costume from the back). Anyway, I made my new costume yesterday morning based on the inspiration thought I had soon after I woke up: “Y’know, I really don’t feel like wearing a corset today.” I basically used my body block as the pattern and made fitting adjustments on myself with pins. Anyone who has ever tailored for herself without a dressmaker’s dummy knows how crazy that can be, but my arms and shoulders are pretty flexible, so it worked out well, all the same. So, happy November, everyone! I hope you enjoyed my little design gallery. I certainly enjoyed constructing it! Warm regards at the start of cold season- E.G.D. Wonderful! Everyone looks very happy to be dressing up in your handiwork.